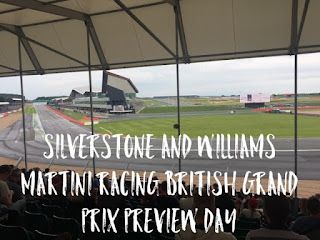 In mid May, I was fortunate enough to spot a tweet from Williams Racing inviting fans to a free event to be held at Silverstone to celebrate 40 years of racing. I immediately followed the link to apply for some tickets to get my family to the event. A few days later, I got an email to say that demand had be much generated than anticipated and they were having to cap the event at 40,000 people. Although they said that anyone who requested tickets before the decision to cap the event would get them, we still had an anxious wait for confirmation that we had got our tickets. Thankfully shortly before the event we got the email I'd been waiting for, confirming our tickets, also the maximum capacity had been extended to be 50,000. This is a crazy number of people to be admitting to a free off calendar event, I'd even go so far as to say that Williams Racing and Silverstone probably got caught off guard by the demand! So the day event came and we set off as early as we could (taking a 2 year old with us), and we arrived at the circuit shortly before 10:00. I've been to the circuit for a number of free events but we ended up parking the further away I've ever been, so we made the trek across the car park to get into see some track action. We could see a number of single seat cars whizzing around the National Circuit, unbeknownst to us this wasn't part of the event so we carried on following the hoards towards the International Circuit were the Williams cars were on display. We came across a bit of a fun-zone which included monster truck experience, bouncy castles, Police speed test (it looked more fun than it sounds), merchandise stalls, football darts and zorbing. The Police were there to show off some of their cars and children could run at a speed camera to find out how quickly they could run. We spent 15 minutes at Abbey (the first corner of the circuit) watching the cars on track go flying past, but it soon became apparent it was a bit too noisy for my son, so we went in search of some ear defenders for him. Unfortunately the first merchandise store we visited didn't have any but thankfully they said they would fetch some from another store - which we were grateful for. We made our way along the Pit Straight to a patch of grass overlooking Vale. After a few more laps the F1 cars returned to the Pits for the first pit walk, where members of the public could get up close with the cars and some of the guests of Williams (including Keke & Nico Rosberg, Nigel Mansell, Damon Hill, Nelson Piquet). Whilst the cars were in the garage, there was more entertainment on the track as the JCB GT excavator started pulling wheelies and zooming up and down the pit straight. We took this opportunity to grab some lunch, but we did get caught in the rain as it arrived at the circuit. We decided this was an opportune moment to relocate, so we headed to the covered stand at Club Corner. After the pause in proceedings whilst the Pit Walks completed, the classic Formula One were sent back out. There was a huge build up to the unleashing of the FW14 back to where it belongs on the track! The announcer really built up the hype, explaining that the last time the car was seen in Britain, Nigel Mansell was giving Ayrton Senna a lift back to the pits after the race. There was an awesome moment as we were leaving as the FW14 and the 2014 FW36 lapped the circuit together. I know that it is highly unlikely that an event like this will be held again, but it was awesome and I'd highly recommend attending anything similar in the future. Whether you're a Formula One fan or not, there was plenty to do away from the track, seeing and listening to all the classic cars is a great way to get a snippet of what Formula One is all about. Even taking a two year old with us, he really enjoyed the experience and at all points I felt safe to let him enjoy himself by running around on his own whilst we watched from afar.